The Black boy model for H&M UK is still going viral. H&M UK posting the Black boy on their website catalog wearing a hoodie with the words “Coolest Monkey In The Jungle” printed over his chest, resulted in celebrities ending their campaigns with the major retailer. H&M released a statement saying they would remove the image and the hoodie from their collection altogether. We have got this wrong and we are deeply sorry. Link in bio. The child’s mother Terry Mango even tried defending the brand. Terry, who’s a Nigerian-born Sweden resident, said she didn’t get why Black people were so upset and didn’t view her son wearing a “coolest monkey” hoodie as an offensive stereotype. The boy’s image was revamped by social media users, with some photoshopping a crown on his head and covering the writing on his hoodie with more affirming titles, in an effort to change the image’s narrative. But for our brothers in the mother land, that simply wasn’t enough. 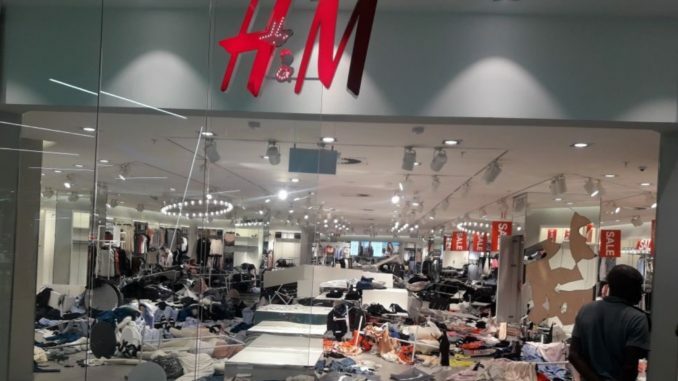 Pictures and videos of an H&M store being destroyed this morning are making its waves across the web. Racists insults us by getting an innocent black child to wear a shirt declaring that he is a monkey! We condemn those protesting this insult telling them to be more peaceful and send petitions! History repeats itself. When land was taken we sent petitions to the Queen for years! – :You are saying every time black People are called baboons or monkeys we must call for a commission of inquiry or stupid dialogues ? It’s time for white privileged to fall.